I was sent a link recently to a survey being conducted by the National Landlords Association to find out the UKs best property forum for landlords. So I thought this might be a good opportunity to take a look at them. Some of the forums in the survey I knew quite well – others less so. This is my own forum and of course I know it very well! I was surprised to see it listed however as it is a closed forum not an open one, and is only available to members of my Landlord Law service. As Landlord Law is a paid service, there are obviously going to be less users here than on the other, free, forums. The forum is sometimes used by landlords for general discussion, but mostly it is used by members to ask me questions about things which are bothering them. So generally once or twice a day I go in and answer them all. Its a very useful service for members and is one of the reasons why members stay with me a long time. Of course there is also a lot of discussion on this blog – but the survey said Landlord Law, not the Landlord Law Blog. Maybe they meant the blog and put Landlord Law by mistake. This is probably my favourite of the landlord forums (apart from my own of course …). It is run by property investors Vanessa Warwick and Nick Tadd and is free to use. It has been going quite a few years – initially it was hosted on a Ning site, but then about a year ago moved to their own bespoke site. Its a great place for landlords to go and meet other landlords and discuss landlord issues. You will also meet quite a few experts there, such as property investor John Corey, myself on occasion, not to mention Vanessa herself who has a lot of wisdom to impart. Nick and Vanessa were formerly working in television and Nick is a professional cameraman, so they also have an excellent Property Tribes TV section with filmed interviews of industry experts, which is worth a visit. LandlordZONE run by Tom Entwistle has been around a long, long time and is much respected. The associated forum has also been going quite a while and is very popular and lively. I understand that they have quite animated discussions there on all aspects of landlording. The forums are moderated by people experienced in the field. One of the LandlordZone forum members, Westminster, comments on this blog from time to time. It is another good place for landlords to go for to discuss issues with other landlords and get feedback and advice. This is really an advertising site, but with very good news items to bring people onto the site so they see the ads. I subscribe to their newsletter and generally enjoy the news items although some people have complained that they are sometimes not as accurate as they could be – but hey! Thats journalism for you! You can also register to the site and take part in blog comment discussions at the end of the news items. This is another landlords site that has been around for a long time. Like the others (apart from Landlord Law) it is run on the model where information and services are given away for free with the organisers income (presumably) coming from affiliate sales and advertising. I was not aware that they had a forum until now, but having gone to have a look, there it is. It seems to be less important on the site than the other services however. Never having used it, I can’t really comment though. This is the ‘new kid on the block’ and the site was set up by Mark Alexander, formerly of the Money Centre, a year or so ago. 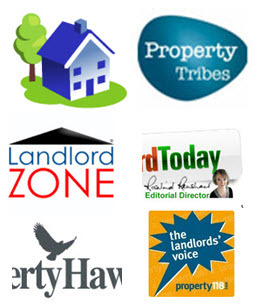 It has the usual services, and a services directory, but the best parts of the site are the excellent articles written by experienced landlords and various experts – I did a series for them myself in 2011 – which often attract lively discussions. I see that there is also now a section called ‘forum’ although the format seems similar to the articles – ie a post about something with discussion underneath. Property 118 is the other site where I post comments occasionally, and Ben Reeve Lewis has written quite a bit for them. This is a huge forum, very lively and they often write about landlord and tenant issues. However the site has a massive remit and covers all areas relating to money, so the tenancy bits are a small part of the whole. It also tends to be mainly tenants who go there – seeking advice on their problems – but I have seen landlords there from time to time (I take a look sometimes when I see links to my blog posts in my stats …). So thats the forums (or is it forai?). What do you think of them? Do you use them much? Do you find them helpful? And are there any which have been missed out? Leave a comment if so and tell us about them. ‘Property Investment Project’. The landlord posts tales (usually of woe) about his tenants. Rude and funny, but his advice is sound. Regular comments from other landlords who are just as funny and who revel in his misfortune. However, there is a lot of good information on this site – such as details of his recent battle with condensation and mould.